Purchase Orders and Government IMPAC Cards Accepted!! These powerful compact models are as small as a wastebasket and designed for use alongside the desk or work station. They provide on-the-spot destruction of sensitive paperwork, phone messages and notes generated during the day. Ideal for use by busy professionals or for the small home office. Our office shredders are built to the highest standards for operator convenience, safety, and reliability in a wide variety of models. Choices include a range of shred sizes, manual or automatic operation and various sized feed openings. Whatever the application or security level, Formax Shredders are designed to handle your company's sensitive and private information. These high capacity machines are designed for large volume shredding in a central location and can serve the needs of an entire organization. Powerful enough to shred just about anything including entire files, stacks of computer forms, cardboard,tapes, ribbons, CDs and magnetic disks. 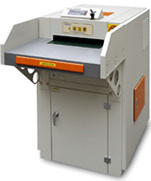 Formax Shredders include standard features include a powerful AC geared-motor with heavy-duty steel gears for high performance and minimal noise, automatic start/stop/reverse, specially-hardened steel shredding blades, sensors for safety and convenience, an easy-to-use control panel, lifetime guaranteed high-density waste bin, and heavy-duty steel cabinets.